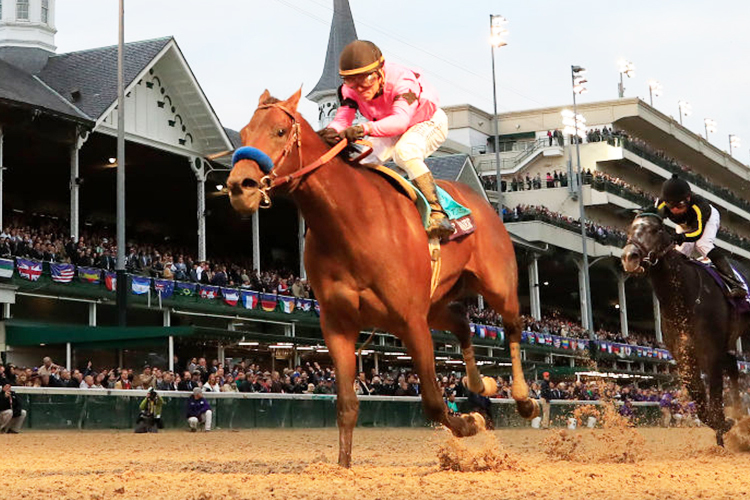 The results are sure to define the picture for Churchill Downs as the trio of nine furlong events around two turns gives the stronger staying horses the chance to emerge. The $1 million Santa Anita Derby sees last year’s unbeaten juvenile Game Winner out to prove he is a worthy contender for the Run for the Roses after suffering his first defeat at his last start in a division of the G2 Rebel Stakes. As a 2YO he won three G1 events including the Breeders’ Cup Juvenile and is undoubtedly a top-class horse but in the Rebel Stakes was unable to run down the highly talented Omaha Beach, universally rated a serious threat to all in the Derby. You can easily make a case that Omaha Beach and Game Winner are the two best three-year-old colts in America given that they pulled more than eight lengths clear of the rest in the Rebel. If that opinion is valid and given that Game Winner will relish the slightly longer trip he is very much the one to beat in the Santa Anita Derby. Rivals to be respected are Roadster and Nolo Contesto. Roadster beat Nolo Contesto by two and a half lengths in an allowance race over a mile at Santa Anita a month ago but there were extenuating circumstances for the runner-up. Roadster was impressive but his wind has been less than perfect and he still carries his head at a slightly awkward angle. Some two months earlier Nolo Contesto had run down Omaha Beach to win his maiden by a half length. He has been patiently handled by trainer John Sadler and this may be the day when he takes a serious step forward. The $750,000 Wood Memorial at Aqueduct is New York’s serious Derby prep race and has a star attraction in the impressive colt Tacitus. The beautifully bred Tacitus is by Tapit out of Close Hatches, who won five G1 races. Last month Tactitus took his first step towards emulating mother by winning the G2 Tampa Bay Derby at his third career start in determined style that marked him as a very strong stayer. He was green and looked in some trouble approaching the home turn at Tampa Bay but really impressed with the way he battled on to defeat Outshine, who re-opposes in the Wood. With that race under his belt Tacitus returns to Aqueduct where he broke his maiden last October. He has obviously taken some time to develop and there is a strong chance plenty more is to come. The one to watch may be Hoffa’s Union who is showing he has distance potential as a strong-galloping racer who hits the line hard. His only start resulted in a Laurel Park maiden win by more than 15 lengths in fast time, stamping him as a fascinating prospect in the big time. It is a big ask on only his second start and first over the Aqueduct surface but this colt may have serious talent. The $1 million Blue Grass Stakes at Keeneland gives Vekoma his chance to prove his worth as a serious Derby contender. LIkle Game Winner he is by Candy Ride, currently the most effective sire in the world on dirt. Trained by George Weaver Vekoma was having only his third career start when finishing a fine third in G2 Fountain of Youth Stakes at Gulfstream in Florida last month. That form took a bit of a battering in the Florida Derby but Vekoma can move forward off the effort and in common with most of Candy Ride’s stock, should appreciate the chance to tackle nine furlongs. Not that this race will be easy as he meets a big field of 14 and not every horse makes a smooth transition to the dirt surface at Keeneland but Vekoma has seasoning against black-type horses, having won the G3 Nashua at Aqueduct before his Gulfstream defeat. Another one with strong claims is Win Win Win, who could not conjure an outside run in the G2 Tampa Bay Derby but was impressive in fast time on his previous start there. The interesting one may the talented Somelikeithotbrown, a son of Big Brown who has not run on a conventional main track since his debut at Saratoga as a 2YO. Since then he has looked good on turf and synthetics, winning a maiden on turf at Saratoga by eight lengths and going on to finish third in the Breeders’ Cup Juvenile Turf which is the best form on offer here in terms of merit. Somelikeithotbrown took to Turfway Park’s synthetic surface on his last two starts, overcoming trouble to win Listed and G3 races back to back.